Bruno Roy Entered Sunday's race as one of the favorites. 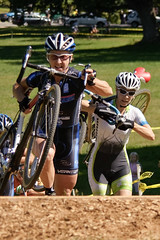 A good argument can be made that the 2009 edition of Charm City Cyclocross featured the strongest elite women’s field racing in North America this past weekend. 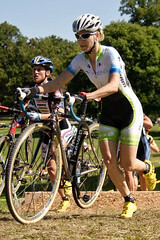 One of the favorites going into Sunday’s race, held September 20 at Druid Hill Park in Baltimore, Maryland, was Maureen “Mo” Bruno Roy, a multiple cyclocross and mountain bike national champion. Bruno Roy, the 2007 MAC Cyclocross Series champion, entered Sunday’s race fast on the heels of a second place finish in Nittany Lion Cross, the MAC season opener. Bruno Roy, who along with her husband Matt Roy make up MM Racing, spent Sunday battling it out in a five women lead group that contained Charm City Cycling stalwarts Laura Van Gilder and Diedre Winfield. What was by far the closest race of the day, came down to an exciting last lap battle. Maureen gives us the inside scoop on how the race unfolded. The natural barrier around the tree. Mo Bruno Roy and Laura Van Gilder battled all day long. The section after the “natural” barrier around the tree leading up through the last barriers was the most decisive part of the race. You really needed to be accelerating through that whole section to get a gap going into the final few turns. I just timed it poorly and ended up chasing coming out of the barriers. Food is pretty much what I eat everyday to ensure it’s easy to digest and gives me enough sustained energy. Either Bob’s Red Mill oats with fruit or soy yogurt with fruit and granola. I usually do one lap of the course and then I warm up on the trainer for about 45 minutes, do another lap before the start and have one GU before the start with some electrolyte drink mix. Have fun. It can be a pretty ridiculous sport and you need to have a good head on your shoulders about it. It can be frustrating to learn the techniques, so go to a local ‘cross practice and meet up with some of your local racers. It’s a fun group of people and it helps to feel like you’re part of the community at the races. This season Dugast Typhoons or Rhinos tubulars on Mavic R-sys wheels. Pressure about 24 on a dry course about 20-22 in the mud. There were some folks that got busted by the park ranger for smoking “something” in their parked car while I was warming up on the trainer. Thank you to all the folks who put on the race, gave us host housing, support women’s racing and for cheering me on! Huge thanks to my sponsors, Seven Cycles, Wheelworks, Mavic, SRAM, Franson Chiropractic, Champion System, Ibex and Bob’s Red Mill, Cyclocrossworld, Fizik, Alpha Q and Thule. To my husband/mechanic/biggest supporter/teammate Matt!